Neckole Herring is surrounded by her children: Govanna, 16, Martell, 12, Martwion, 8, and Marquis, 10. Neckole Herring has her hands full not only as a mother to four children but as a mother to four children with asthma. 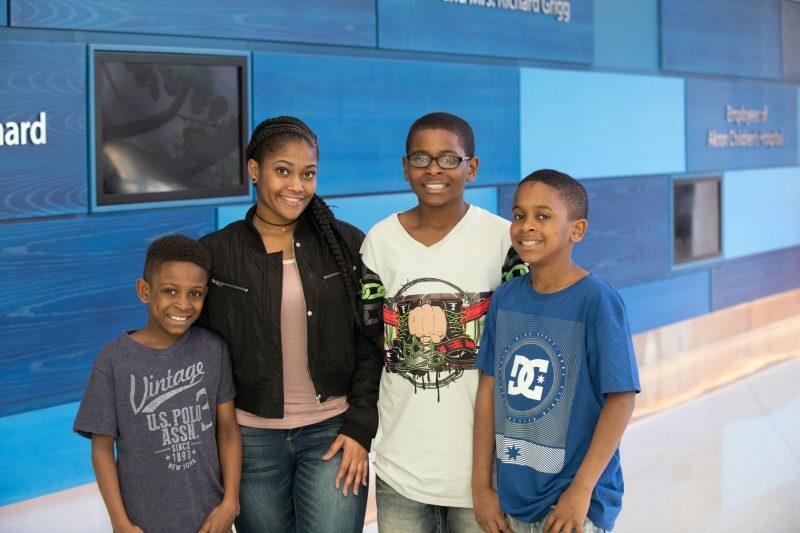 Herring feels her children – Govanna, 16, Martell, 12, Marquis, 10, and Martwion, 8 – have their asthma mostly under control thanks to Dr. P. Cooper White, their pediatrician at Akron Children’s Hospital’s Locust Pediatric Care Group. The children are on different medicines as their asthma is of varying degrees of severity. They have asthma plans on file with their school nurses at Akron Public Schools’ Portage Path Elementary, Litchfield Middle and Firestone High Schools just in case of a medical emergency. Dr. P Cooper White talks to Martwion, 8, about his asthma symptoms. 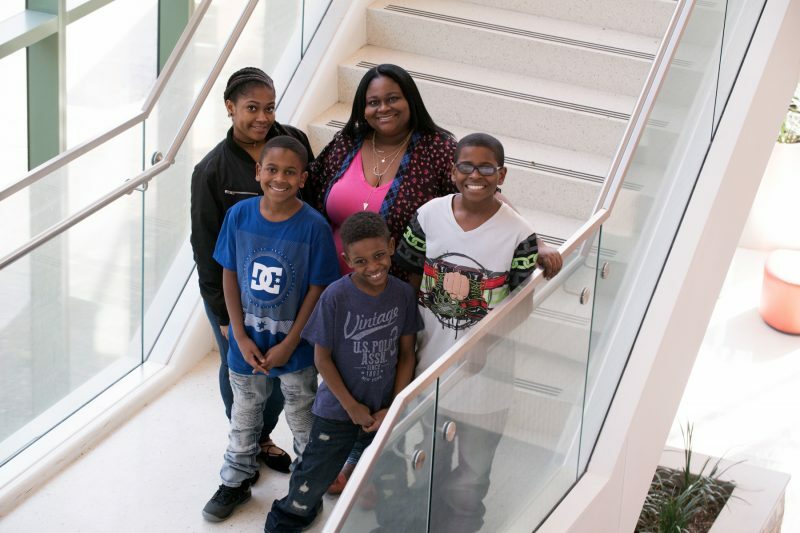 The improvement Neckole has seen in her kids corresponds with an enterprise effort undertaken by Akron Children’s Hospital to make asthma a high-priority healthcare need. In 2014, the hospital created a system-wide registry of asthma patients and began tracking outcomes. Meanwhile, Easy Breathing, an evidence-based asthma management program, rolled out in Akron Children’s 27 primary care offices throughout Northeast Ohio. 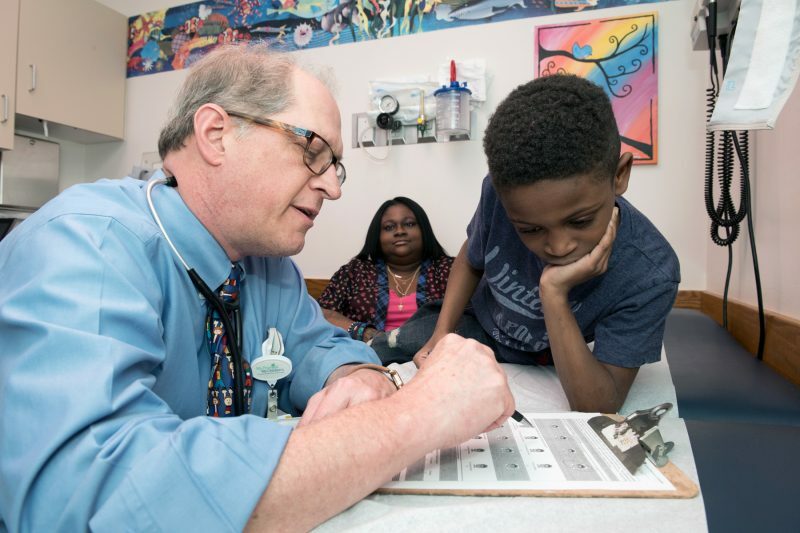 As a result, Akron Children’s has seen a 15% decrease in the number of asthma patients making ER visits and a 30% decrease in asthma-related hospitalizations. On an annual basis, these results will save more than $3 million in health care expenditures. “The Easy Breathing program includes training and tools that can aid providers in diagnosing asthma, determining its severity, assessing how well it’s controlled, prescribing appropriate therapies and developing a written asthma treatment plan,” said David Karas, MD, a pediatrician at the Akron Children’s Hospital Pediatrics office in Wadsworth who has been leading the implementation of the program at Akron Children’s. Easy Breathing is designed to improve identification of previously unidentified cases of asthma. So, as part of the program, all patients of Akron Children’s pediatric primary care practices receive an asthma screening survey, not just those previously identified as having asthma. The program spells out the appropriate intervals for follow-up based on asthma severity, as well as when a referral to a specialist is needed. About 1 in 10 American children suffer from asthma, making it the leading chronic disease in childhood and the chief cause of missed school days. But with treatment, coordination of care and education, most children with asthma can keep their symptoms under control and avoid unplanned hospital visits. As Neckole Herring can attest, asthma can be managed if you work closely with your health care providers and make sure your children are following their treatment plans. Asthma is not keeping her kids from school or any of the other things they love to do. Martwion, 8, Govanna, 16, Martell, 12, and Marquis, 10.